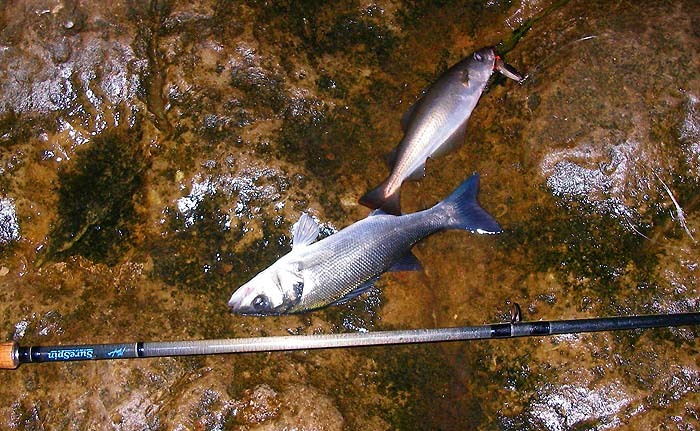 You may recall that a little while back (16 September) I had a decent bass on a live mackerel from a spot where we had not previously had a fish bigger than a few pounds. I commented then that it might just have been a fluke and that I would need another fish to convince me. My exact words were -"Apart from anything else the bass was much heavier than any that we have caught on flies or lures from that spot - surely not a coincidence. Anyway, I shall be trying the technique again just to prove the point." I've now had a couple more goes - both short (1-1.5 hour) early morning sessions. I geared up to catch bait with a small Toby on the end and an uptrace Mylar fly. On the first attempt it was pretty rough (=dangerous) and I could not buy a bite from mackerel. 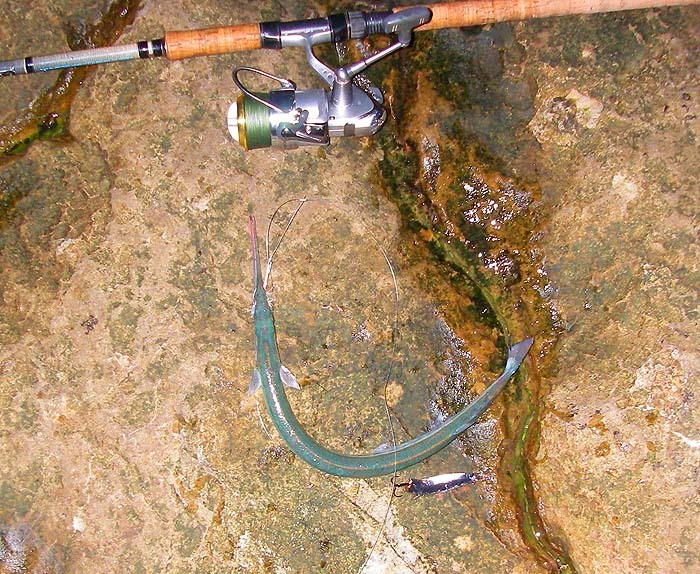 Eventually I hooked a garfish on the fly but by then it was time for me to go home so I released the gar. I went again the following morning and found the sea much calmer. The wind had eased and the swell had gone down. The tide was just beginning to rise when I started fishing at about 06.15. After about ten minutes I had a couple of feeble bites (?garfish?) 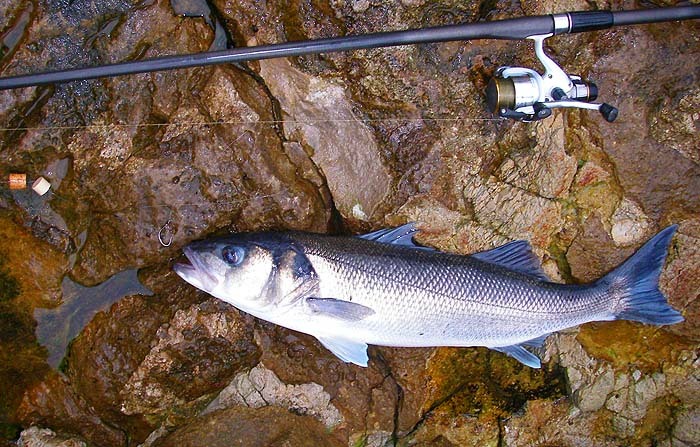 and then hooked a splashy little fish which turned out to be a small schoolie on the Toby, it fell off into a rockpool so I cast again and promptly hooked a small pollack of about 20cm long. I took their picture, released the bass and put the pollack on the livebait rod (circle hook and wine bottle cork float). The pollack swam round gamely for about fifteen minutes and nothing happened so I picked up the spinning rod and had another cast. 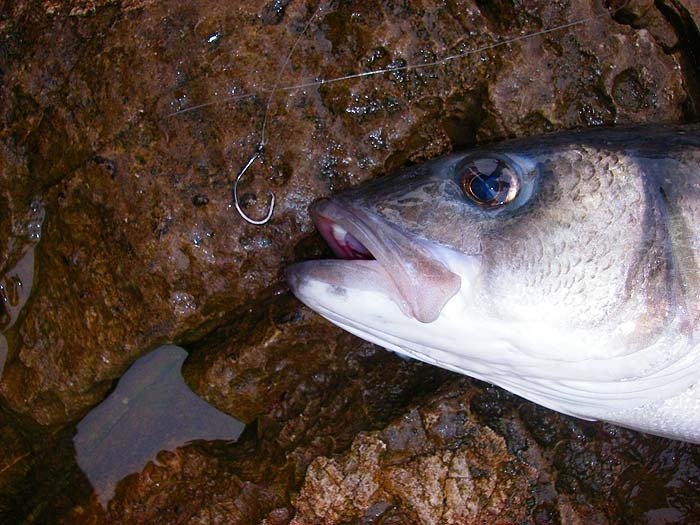 First chuck the Toby was taken by a mackerel which I reeled in and used as a replacement for the pollack. By now I was looking at my watch and thinking it was about time I packed in. However, I lowered the mackerel into the sea and let it swim off. For about ten minutes it ploughed along towing the corks behind it and occasionally splashing on the surface. Suddenly I felt a hard knock on the rod and the line began to stream off the spool. As I'd done before I let the fish take a lot of line before I closed the bale arm and tightened - the fish was on! It was a good scrap, not least when I had to land the bass by jumping down onto a lower ledge already awash with the swell. The fish was perfectly hooked in the upper lip and was in fine fat condition. I weighed it (unusual for me) and it proved to be just under eleven-and-a-half-pounds. Live mackerel baits - now I'm convinced!. My best bass of the year so far.